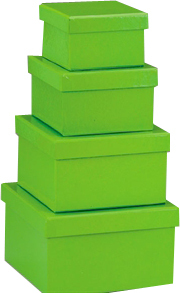 Nested Boxes are rigid set up boxes that are made of high quality paper board,covered by matt laminated art paper with different printing,These nested boxes are beautiful,colorful coming in square or round shape,in a vast assortment of colors and design,sized to stack inside of each other,a great presentation and sturdy display of gifts and decorative storage.As gift boxes wholesale,Gift Boxes Shop design,manufacture and wholesale nested gift boxes coming in following specification. 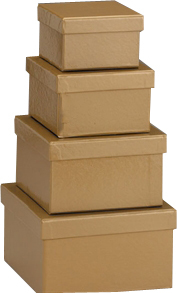 Gift Boxes Shop wholesale nested gift boxes coming in square shape and stacked sizes: 4 sizes per set. Those nested gift boxes are made of high quality paper board,covered by art paper with solid color printing or creative design printing,matt lamination to offer silk feeling and add more class touch to products.These nested gift boxes available in 33 designs, custom logo can be printed on boxes by hot stamping. 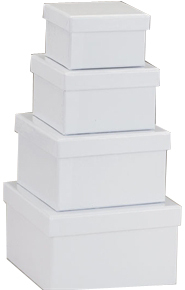 Nested Gift Boxes are not only perfect gift boxes for gift-giving,but also a great display stack in shop that will attract customer's attention.At Gift Box Shop,those nested gift boxes come in round shape,avail 15 designs and 3 sizes per set,custom logo can be printed on boxes lid by hot stamping. 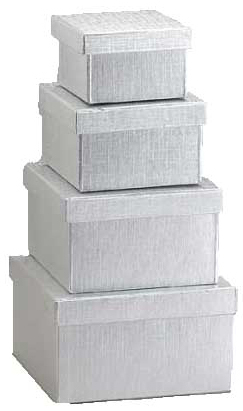 Those beautiful,creative nested boxes are not only used as gift boxes to present gift or products, but also as decorative storage in shop, the nested gift boxes come in square shape,3 sizes per set.avail 10 designs , and custom logo can be print on boxes by hot stamping.Gift Box Shop wholesale nested gift boxes at great cheap wholesale pricing. 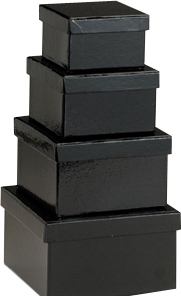 Gift Boxes Shop wholesale wide selection of nested boxes that come in many sizes,designs and colors.Those nested boxes are hand made by high quality standard.and from eco friendly material.No matter how many sets you need, you can get wholesale price. Gift Boxes Shop also offer custom logo printing service--to make personalized nested boxes, custom logo can be printed on nested boxes by hot stamping. 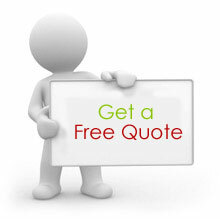 Contact with us to get cheap nested boxes now!